Bruno Junqueira seems to be so keen to go racing again – after his big accident at Indianapolis last May – that he’s announced (on his website, in Portuguese) that he’ll be racing for Multimatic Motorsports Team Panoz at Sebring in just over two weeks’ time. He’s expecting to share the #51 Esperante with Gunnar Jeannette and Tom Milner – while the suggestion is that Sebastien Bourdais will race the #50, with Scott Maxwell and David Brabham. 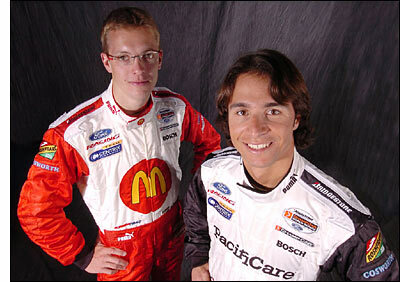 2004 saw Junqueira finish as runner-up to his Newman-Haas team-mate, the Frenchman Bourdais. There are several obvious associations between Multimatic, Panoz and Newman-Haas, not least that Multimatic is reponsible for the development of the shock absorbers on the Newman-Haas Lolas – which will be replaced with Panoz chassis in 2007. This news is now confirmed, Bourdais explaining that "our testing is very restricted in Champ Cars so it is handy to get additional miles at this time of year. The race is going to be very interesting as well because the competition in GT2 is looking very strong – I am really looking forward to the battle. The team's four regular drivers are testing this week at Road Atlanta.